A new study conducted at the University of California, Davis found that two cups of mangos a day had beneficial effects on systolic blood pressure among healthy postmenopausal women. Mango consumption helped relax blood vessels in as little as two hours after intake. Additionally, some of the participants showed favorable changes in the production of breath methane, an indication of the potential influence on gut fermentation. "This is the first study to demonstrate positive vascular effects of mango intake in humans," said lead researcher Robert Hackman, with the UC Davis Department of Nutrition. He presented the findings today at the American Society for Nutrition annual meeting, Nutrition 2018, in Boston. "Our results build on previous animal and cell studies that point to the potential benefits of mangos to promote health." 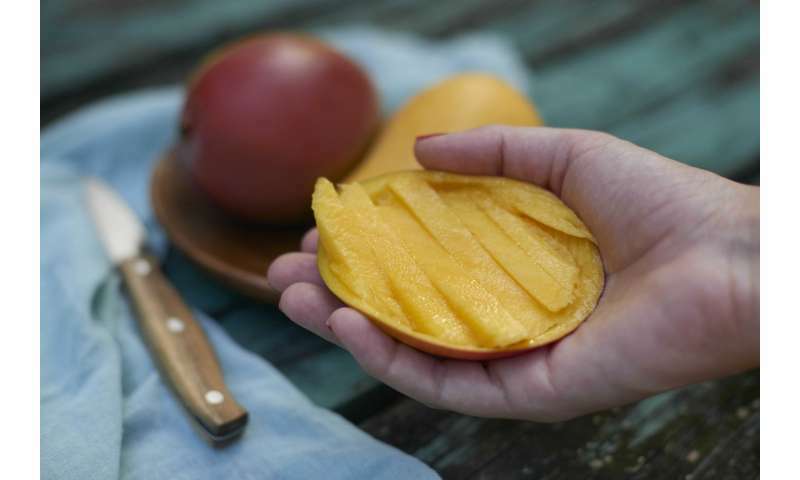 Mangos contain a mix of polyphenols, including mangiferin, quercetin, gallotannins, and gallic acid, that have been the focus of previous investigations exploring the potential health-protecting properties of mangos. Li and colleagues believe the concentration of these bioactive compounds in mangos may be responsible for the favorable response. In the study, 24 healthy postmenopausal women consumed 330 grams (2 cups) of mango daily for 14 days. The honey mango (also referred to as Ataulfo) was chosen for the study due to the high concentration of polyphenols in this popular variety. Following the 14 days of mango consumption, the study participants resumed their normal daily diet but eliminated mango intake for 13 days. Measurements were taken during each visit, including heart rate and blood pressure, blood samples and breath samples, which are increasingly used in nutrition studies to evaluate gut health status. At the start of the study, blood pressure was not significantly different between the study visits. Yet once mango was consumed, systolic blood pressure was significantly lower two hours after mango intake compared to baseline values. Pulse pressure was also significantly reduced two hours after eating mango. Systolic blood pressure (the upper number in blood pressure readings) indicates how much pressure your blood is exerting against your artery walls when the heart beats. Pulse pressure is the difference between systolic and diastolic (bottom number) in blood pressure readings. Pulse pressure can be used as an indicator of heart health. Breath levels of hydrogen and methane were measured, which reflect the amount of these gases that were produced due to microbial fermentation in the intestinal tract. Some study participants produced hydrogen, some produced methane, and others produced both gases or neither of them. Six of the 24 participants produced methane, and of these six, three shown significant reduction after consuming mango, which is considered a favorable outcome for gut health. The researchers conclude that mangos may be a heart-healthy fruit that may help play a role in reducing the risk of cardiovascular disease. Longer-term studies involving other population groups are warranted. More information: Li X, Vanness MA, Holt RR, Horn WF, Keim NL, Keen CL, Hackman RM. Effects of two weeks of daily mango fruit intake on vascular function, blood pressure and gut fermentation in healthy adult women. The FASEB Journal, June 2018.